Dartford is the principal town in the Borough of Dartford, Kent, England. The town is situated on the border of Kent and Greater London, bordering the London Borough of Bexley. It also borders the Borough of Thurrock, Essex, via the Dartford Crossing of the River Thames and Gravesham to its east. The town centre lies in a valley through which the River Darent flows, and where the old road from London to Dover crossed: hence the name, from Darent + ford. 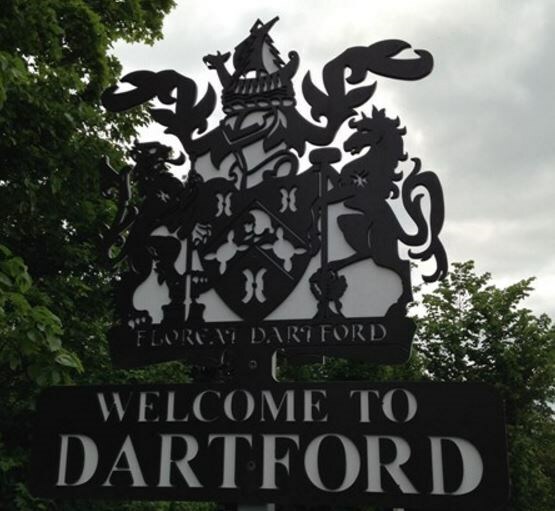 Dartford became a market town in medieval times and, although today it is principally acommuter town for Greater London, it has a long history of religious, industrial and cultural importance. It is an important rail hub; the main through-road now by-passes the town itself. The Dartford sign is on a very busy road and you will be unable to stop there but you will most probably pass it. I have added coordinates for safe parking and so you will be able to walk to the information required for stage 1. Might be safer to drive to location due to the very busy road. Thanks to Smokeypugs for allowing this VS.